The was shot at the Vatican during a cold and rainy day in December. This is a great time to visit Rome if you can tolerate a bit of inclement weather – there are far fewer people scurrying about and makes the job of the Photographer much easier! We were lucky in that it rained steadily only one day, and so we planned to be inside The Vatican to marvel at this amazing monument and shoot a few frames. The Chair of Saint Peter is a relic conserved in St. Peter’s Basilica, enclosed in a gilt bronze casing that was designed by Gian Lorenzo Bernini and executed 1647-53. It was often thought to have been used by Saint Peter himself, but was in fact a gift from Charles the Bald to the Pope in 875. Like many medieval reliquaries it takes the form of the relic it protects, in this case a chair. Symbolically, the chair Bernini designed had no earthly counterpart in actual contemporary furnishings: it is formed entirely of scrolling members, enclosing a cover panel where the upholstery pattern is rendered as a low relief of Christ giving the keys to Peter. Large angelic figures flank an openwork panel beneath a highly realistic bronze seat cushion, vividly empty: the relic is encased within. The cathedra is lofted on splayed scrolling bars that appear to be effortlessly supported by four over-lifesize bronze Doctors of the Church. The cathedra appears to hover over the altar in the basilica’s apse, lit by a central tinted window through which light streams, illuminating the gilded glory of sunrays and sculpted clouds that surrounds the window. Like Bernini’s Ecstasy of St Theresa, this is a definitive fusion of the Baroque arts, unifying sculpture and richly polychrome architecture and manipulating effects of light. Above, on the golden background of the frieze, is the Latin inscription: “O Pastor Ecclesiae, tu omnes Christi pascis agnos et oves” (O pastor of the Church, you feed all Christ’s lambs and sheep). On the right is the same writing in Greek. 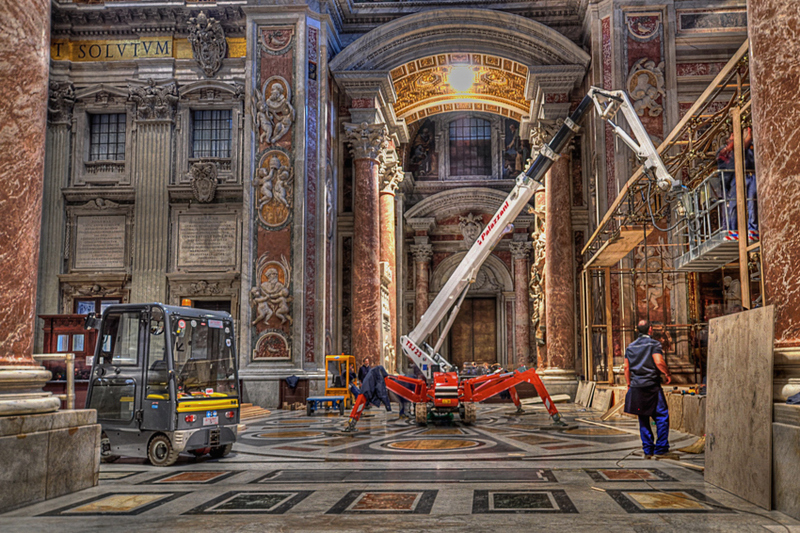 Behind the altar is placed Bernini’s monument enclosing the wooden chair, both of which are seen as symbolic of the authority of the Bishop of Rome as Vicar of Christ and successor of Saint Peter. To purchase a Digital Download for personal use or a Print for your wall, click on the picture and you will go straight to our photo website! 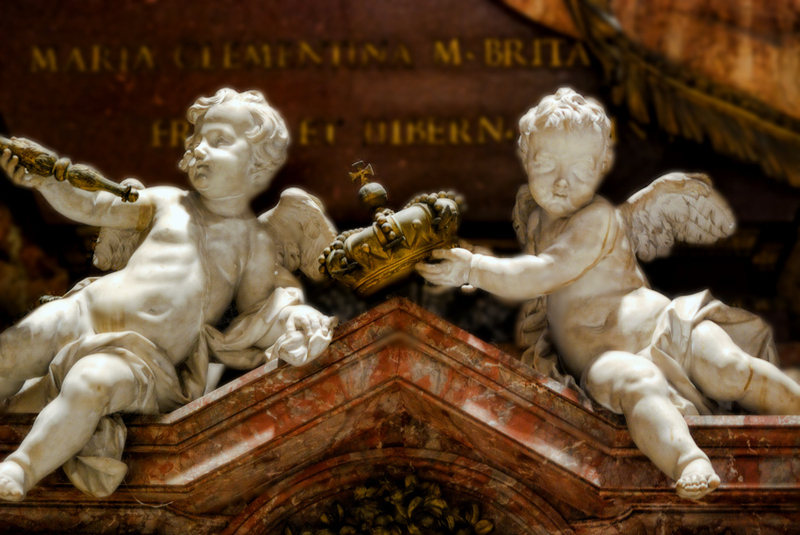 These two Cherubs can be found cavorting inside St. Peter’s Basilica, in the Vatican….a very Merry Christmas to All ! St Peter’s Basilica is one of the most spectacular sights in Rome if not anywhere. I was shocked to see that photos were allowed and took advantage to grab some great HDR shots which are on the way. While exploring, I found this insect like rig engaged in repairs of the marble work and was struck by the contrast of old and new. I guess even St.Peter needs a hand now and then!